Soursop is the super skin food. This spiky green fruit grown in the southern hemisphere has a bright, refreshing scent that will perk up you morning shower in a snap. We’ve infused our scrub with soursop leaves, which are packed full of vitamins a, b, and c and have been shown to reduce irritation from eczema, rheumatism, and other skin conditions (sweet relief). We’ve blended in some dead sea mineral salt and brown sugar to help smooth away any lumps and bumps, and the all-star cast of essential oils will help moisturize and protect your skin from all sorts of nasty stuff. 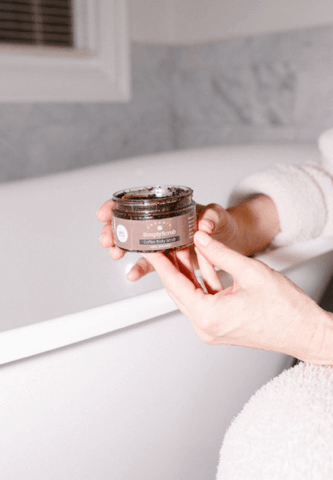 Now available in a (super-cute) 3.5 oz tub, your can throw your soursop scrub in your overnight bag and rest assured that the secret to great skin is alway by your side.